Once you decide to start your tour to Israel, checking online for places worth visiting is a must in order to organize your time better and see as much as possible. Among many things that are worth exploring are cocktail bars. We all need some quality time to relax after an exhaustive day, or celebrate and have a great party with friends. Across the country, you can find amazing and exclusive cocktail bars and here, you can find out more about the top four cocktail bars that are a must visit; not only for tourists, they are favorite places for the locals too. The Imperial Craft cocktail bar is small, yet well-formed, offering warm ambience, imaginative and meticulous service approach and hospitality. It is considered to be a temple to the lost art of cocktail, with flourishing reputation. What makes this renowned bar so unique is its dizzying drinking menu. The unique cocktail list changes with every season. They are all carefully and creatively crafted, often leaving the drinkers craving more. The bar also offers its guests potent concoctions like Blackbeard’s Swizzle, Strega Witches liqueur, Mountain made Guatemalan Rum and various other tiki drinks. Other cocktails that many previous visitors highly recommend are The Spicy India, inspired by chai masala. The ingredients include green cardamom, egg yolk, bittersweet chocolate and orange liqueur. Flip a coin is another very popular cocktail, which is made from sherry and French cognac reduction and spices. The bar’s happy hours are from 6-8 pm, with 50 percent off cocktails. When it comes to music, the guests can have fun listening to jazz and rock and roll. The guests can also enjoy the Asian-Colonial inspired kitchen. The Bellboy bar is located on the first floor of the Berdichevsky boutique hotel. This is one of the most unique cocktail bars in the center of Tel Aviv, mostly because of the way the space is decorated and its atmosphere. The place is intimate, in a retro style with a vintage tin ceiling, velvety seating and a parquet floor. Once you’re inside, you cannot get rid of the feeling you’re in a den or library. This place offers something that none of its guests will ever forget: a baby carriage that is wheeled throughout the bar, offering shots to the guests. This cozy and dimly lit bar surprises guests with the way of serving creative and high-quality drinks in amusing assortments of vessels: miniature bathtub with a rubber duck and a real conch shell. The cocktail served in the mini bathtub is called Keep Clean and is a must try one. It features violet-flavored vodka, citrus liqueur, carob syrup, apricot brandy and boozy foam. Not only does this bar serve mouthwatering and sophisticated cocktails, but also some delicious food and small dishes. Happy hours in Bellboy cocktail bar are 6-8 pm, with 1+1 on drinks. If you’re looking for an ideal place for drinks and nibbles, the Bellboy is the perfect one. 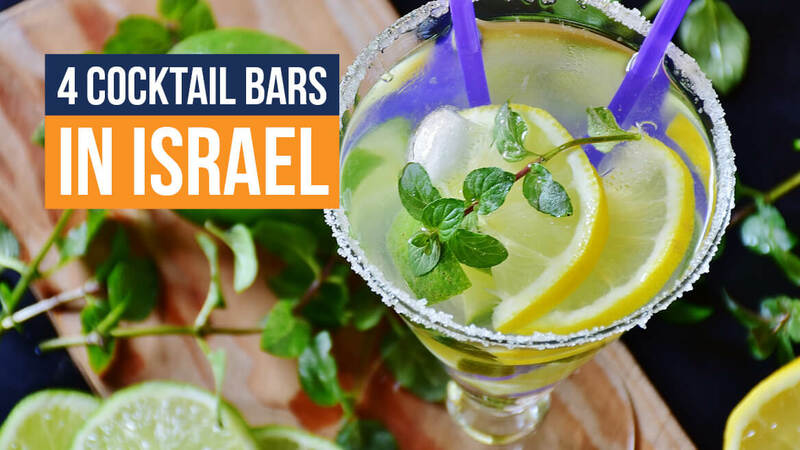 Founded in 2008 by Ariel Leizgold, one of the world’s most popular bartenders, 223 is the first and the oldest running cocktail bar in Israel. It serves top class cocktails prepared by professional bartenders who also help you choose the right cocktail for you when in doubt. The bar’s rich menu offers strong cocktails and very delicious and special bar snacks and food. The place quickly became famous for its irresistible ornate cocktails from high-quality ingredients, natural flavors and fruits, and its rectangular, thin crust pizza. The place is elegant and sophisticated. The upstairs section of the bar is attic-like, featuring comfortable lounge seating. The place is pretty quiet during weekdays, which makes it a perfect place for a date or hanging out with friends. Weekends are busy, with excellent music and many people. A must try cocktail is Passion Fruit 2006, that brought the bar’s founder a winning award in Finlandia Vodka Cup Crowns Championship. Passion Fruit 2006 features vodka, apricot brandy, ginger and passion fruit. The Imperial Red cocktail bar is a part of a Carmim Hotel of Isrotel Exclusive Collection. This bar is a branch of the renowned bar, the Imperial Craft, from Tel Aviv. Inspired by New Orleans jazz clubs, the place offers a mature and exclusive atmosphere, creative and top quality cocktails and wines, and bar snack menu. The place is also kosher, serving various small dishes and fresh food which is always beautifully presented. A room for up to forty people can be rented for private parties. Happy hours are from 5:30 pm to 7.30 pm, with 50 percent off on selected cocktails.